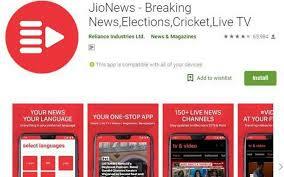 Adding another service that adds value to its subscribers, Jio has launched a digital product called JioNews in the form of a mobile application as well as web-based service (www.jionews.com). The app is available on both the Google Play Store & Apple App Store for users to download. The launch of JioNews comes at a time when the nation will be glued to the Lok Sabha and Assembly Elections 2019, IPL 2019, Cricket World Cup 2019 and other major events across India & the world. Users will get the latest news on the move on JioNews. The press note states that it is a one-stop solution for Breaking News, Live TV, Videos, Magazines, Newspapers & much more. JioNews offers its users the power to personalize their reading experience by choosing preferences from 12+ Indian languages. With breaking news, every second, 150+ Live News channels, 800+ Magazines, 250+ Newspapers, Famous Blogs and news websites from India and across the world, JioNews will attempt to bring the best news content as fast as possible. For those who prefer reading, they will be able to choose from 800+ magazines across various categories. They can start their mornings with leading daily newspapers from across the country and much more on JioNews. JioNews is a consolidated offering of JioXpressNews, JioMags, and JioNewsPaper with an additional offering of Live TV and videos. All existing users of these apps will be migrated to JioNews and Jio assures that they can seamlessly continue consuming content with JioNews. Jio users will have premium access to all the features of the JioNews app. Non-Jio users can access all the features in the app by simply logging in to it during the trial period. To its slew of services, Jio adds News App to keep subscribers updated on the latest happenings 0 out of 5 based on 0 ratings. 0 user reviews.